Megaliths are very large stones, as their name implies. They are often found alone or clustered around ancient trading centers and along their routes dotting rivers, and coastal regions globally. Though difficult to date, most agree they begin to appear between 12,000 to 7,000 years ago. Dating when these rocks were made is a sketchy en-devour at best, and archaeological finds around them have been laid down in the subsequent millennia. I believe their purposes were utilitarian and served a myriad of functions including but not limited to navigational devices, borders, and defense lines for the ancient mining and trade industry in an era of archery warfare. Classical civilizations, notably the Persians, Parthians, Indians, Koreans, Chinese, and Japanese fielded large numbers of archers in their armies. Arrows were destructive against massed formations, and the use of archers often proved decisive. The Sanskrit term for archery, dhanurveda, came to refer to martial arts in general. Mounted archers were the main military force of most of the equestrian nomads from the Cimmerians to the Mongols. 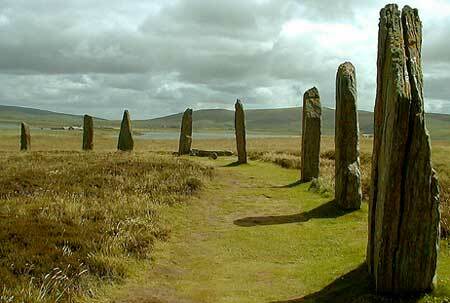 A common feature shared by megalithic sites is the prevalence of Menhirs. 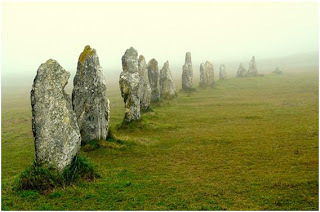 Menhirs are large freestanding stones arranged in lines, rows, semicircles, and circles. Rows would service brilliantly as shields. An archer need only shoot out between the stones and duck back quickly to safety. Or perhaps aim out over the stones using notches and holes for guides. 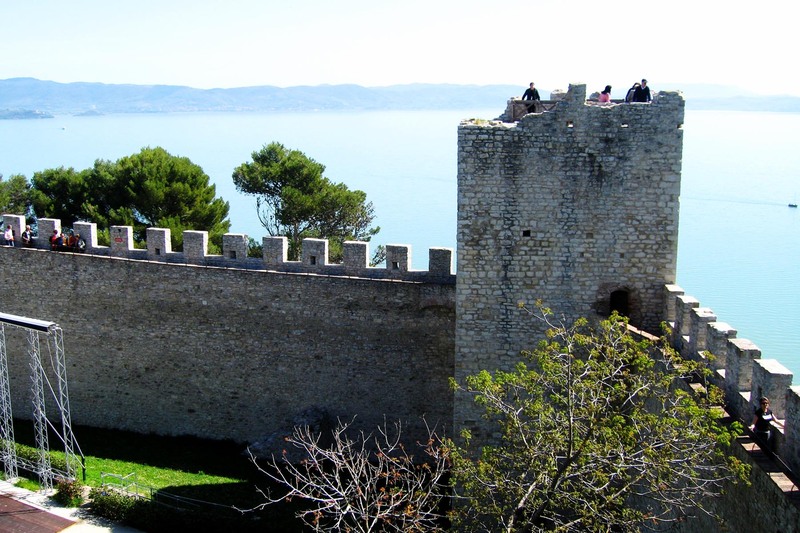 A testament to how beautifully this design works is seen in a more recent fortress, Castiglione on Lago Trasimeno in Italy. The Chinese went to great lengths to secure their own borders and corridors. The Great Wall of China has a double set of this defense strategy. The oval alignment of stones in the photo below it is found in South Sweden on the cliffs overlooking the Baltic Sea. We continued shooting arrows out from behind stone defense lines for thousands of years all over the planet because quite simply, it was a good idea. Megaliths have been found all over the world from the Orkney Islands in North Scotland , along the coasts of Ireland, England, the Iberian Peninsula which includes Spain and Portugal. They continue to pop up in France to Russia, down to the southern shores of India stretching all the way to Indonesia, Korea and the Americas. 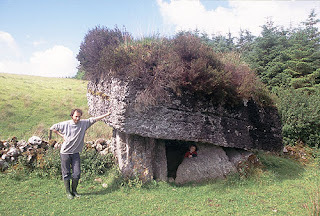 Megalithic sites all over the world are staggering in their scale. Stones that weigh several tons and are meters tall are the norm. Great effort was required to move these behemoths, as they sometimes came from quarries kilometers away. They are not haphazardly placed. Utmost care was given to each stone in regards to its size, shape, orientation, relationship to surroundings, and function. 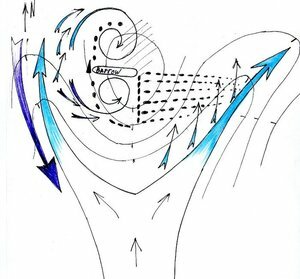 Semi circular and circular formations provide for an optimum cone shaped field of range. The view from a turret in Marksburg Castle, Germany exemplifies this well. 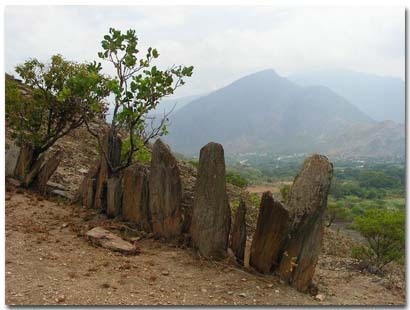 Rows of stones along gentle slopes would provide passage ways for goods and protective corridors for soldiers as well as large areas from which to return fire. 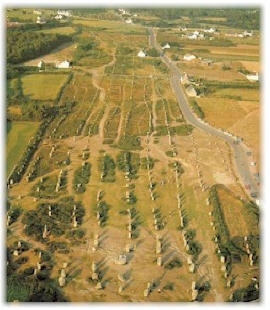 Carnac in France, seen in the two following phots has excellent examples of these. A diagram showing old waterways in relation to rows makes a good case for their use in trade and defense. The the black dashes represents the stones and their orientation. The blue and purple arrows are ancient water ways and flow direction. They were often arranged with their broadest plateau facing the same direction, this is an intentional design to maximize surface area protection. These corridors may have linked docking and exchange centers for the transport and trade of goods. If mined goods were being ported to the shores, an armed guard may have ensured the goods being exchanged was actually going to arrive at their destinations. The development of metal tools, beginning with copper during the Copper Age (about 3,300 BC) and followed shortly by bronze led to the Bronze Age sword and similar weapons. The first defensive structures and fortifications appeared in the Bronze Age, indicating an increased need for security. Weapons designed to breach fortifications followed soon after, for example the battering ram was in use by 2500 BC. It is no coincidence that these sites appear seemingly out of the blue in places like Ireland at about this time. 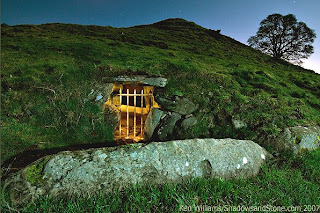 Ireland is home to a great many of these sites and has surely been influenced by their magical qualities, but Celts do not arrive in Ireland until thousands of years after their construction, long after the memory of their story had died. "Counties Cork and Kerry, on the south-west tip of the island, produced the bulk of Ireland's copper and it has been estimated [3 p114] that together the counties produced 370 tonnes of copper during this era. 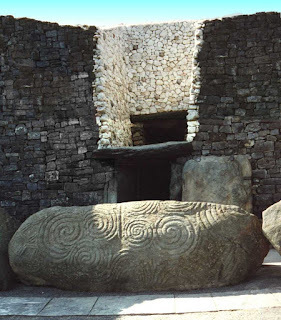 Given the fact that all Bronze Age artifacts so far found add up to around 0.2% of this total, and notwithstanding those that have been destroyed or lost down the years, it seems that Ireland exported a lot of copper during the Bronze Age." 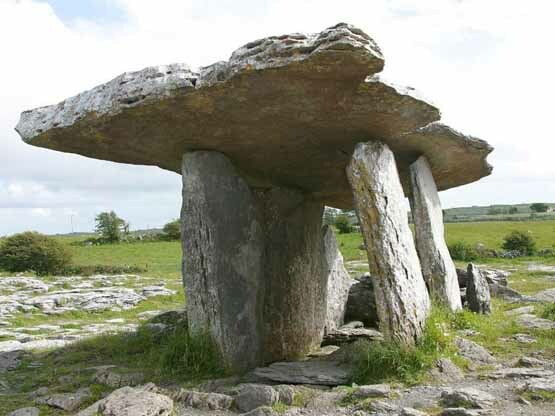 Dolmens are large stone structures often made by placing a capstone horizontally over two or more standing rocks. Tens of thousands of these have been found in Korea. Interestingly, great care was taken to ensure a particular angle of the table tops. This design would certainly increase surface area on a plane of arched trajectory. Covered in earth these structures are indistinguishable from their surroundings. Some of these dolmen show evidence of having been backfilled and covered in plants. They are not meant to be seen. Some also show evidence of use as a burial grounds, but most do not. This is telling in that they were originally not built as tombs. Furthermore, recent discoveries at sites such as Catalhoyok show that the dead were sometimes interred within the walls, floors, and some times directly below sleeping areas. Some culture view of death differently. Beliefs in ancient times may likewise not match our own, perhaps death is but a temporary state of being in varying places at differing times. The dolmen in Russia resemble hobbit homes and may very well have served as temporary housing for migrant miners and or troops and storage for goods, supplies, and weapons. A plethora of evidence exits in the archaeological records of stone tools, pottery and arrows around these sites. 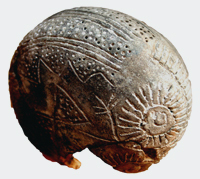 Observations, in archaeological finds indicating these sites were only temporarily occupied, fit neatly into this idea. Hunting and gathering is the best way to secure food if your residence is not permanent. The abundance of pottery supports the idea that these builders were transporting quite a lot of things. Dried foods and grains would have been needed to bring along on a mining expedition. These pots could then be used to transport goods onto the next exchange center where they can be refilled again with dried foods plus a bit of profit for the trouble. 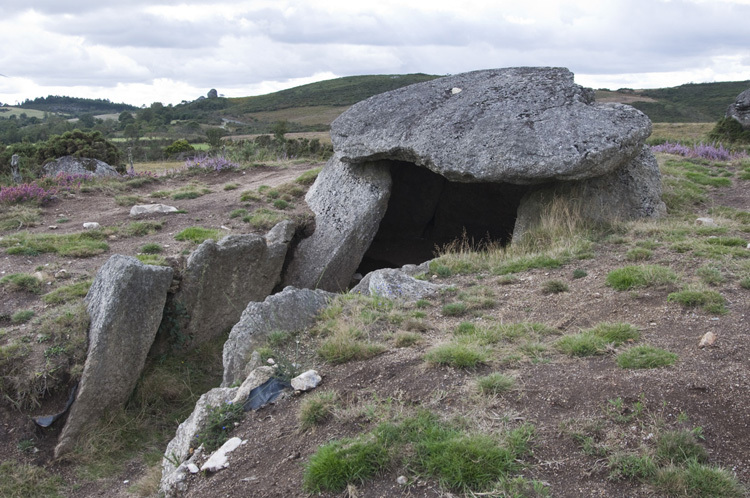 A covered Dolmen on the south eastern coast of Ireland. Their locations are strategic and many features of these sites have elements that clearly reveal knowledge of celestial events. Megaliths the world over are frequently found along well established trade routes. They dot water ways all across the planet, overlooking banks and curves along rivers' and oceans' edges and bends. Distances between quarries and sites emphasize the importance of location outweighing any obstacle of transportation. A Great deal of research and plenty of speculations have gone into deciphering the purpose of these sites. 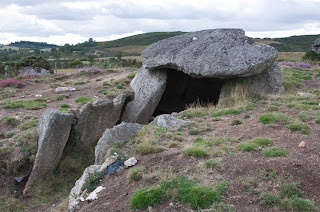 Burial chambers, portal tombs, and mounds are also a part of the Megalithic landscape. Perhaps the fact that they are named "tombs" has influenced our interpretations of them, for those familiar with Dr. Wiseman's book Quirckology. Like dolmen they are often designed to blend seamlessly into their surroundings. These were not places of ostentation. The fact that they are aligned to one another and often mark lunar and solar solstices has given fodder to some rather interesting theories. Strategic meeting places and aligned solstice markers are not mutually exclusive explanations. In fact it makes perfectly good sense these places have an immediate way for its users to determine things like seasonal changes and what direction they were facing. This knowledge would have been necessary if they were a part of a larger trading and shipping operation. Compass calendars would come in quite handy in light of the challenges posed by planning broad range trade and military defense before gps and google earth. One would need to know one's location in relationship to other markers and or troops along with the lay of the land. A big permanent astrolabe, of sorts, may have been indispensable as a tool of trade. Smaller numbers of people could defend larger areas with permanent fire resistant impenetrable fortresses . 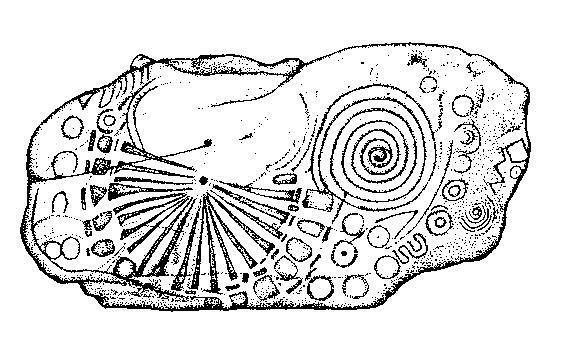 Another interesting element these sites often share is the the prevalence of decorated stones. Some beautifully carved kerbstones are found in New Grange, Ireland dating back to 5200 years ago. 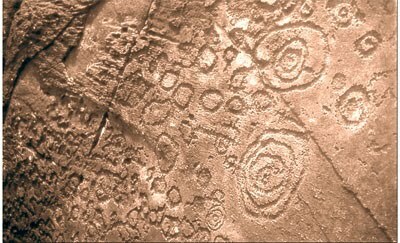 Cups, circles, lines, and other various markings cover a good number of rocks at the site. Topographical information could have been conveyed in this way. The number of rings correspond to altitude,or population densities, or mining oportunitiews while area is described by the area of the outer ring. 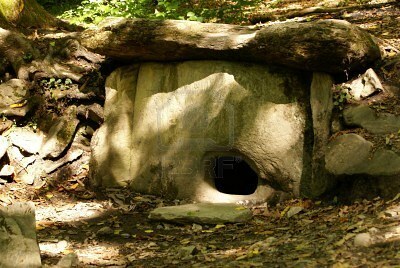 It was a three dimensional representation which sometimes took advantage of natural features in the stone. 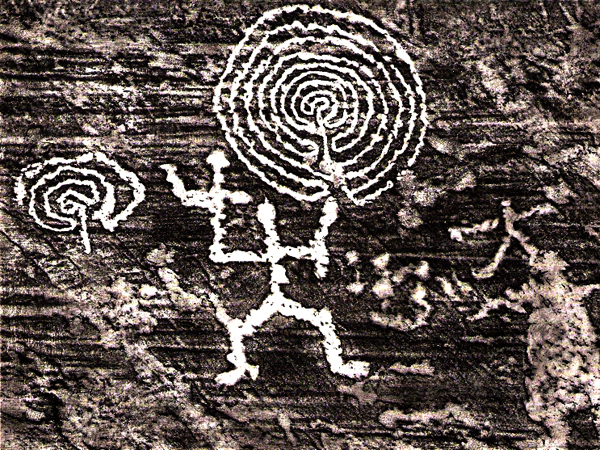 Other markings may similarly be looked at as geographical features, or vulnerable areas, or perhaps the best places to mine. They were essentially maps. 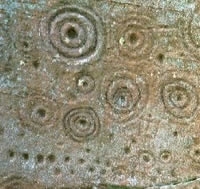 Circle patterns are found in a wide range of locations globally. These may have conveyed areas under security. They look as though someone attempted to fill in all the space with circles until they touched each other, this was security. 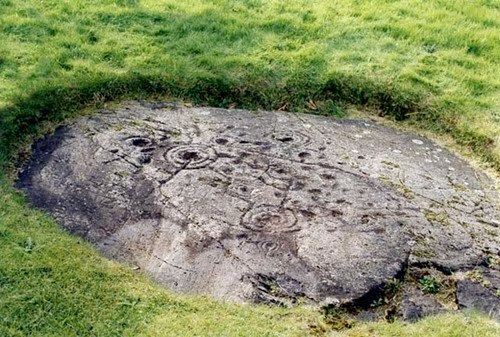 "The thumbnail image (above) shows a linear collection of circular features (notice the line of circles near the bottom of the image) at a site called Ballochmyle near Scotland. Reminds me so much of those linear features off the coast of Scotland and seems like an incredible coincidence or intentional design. 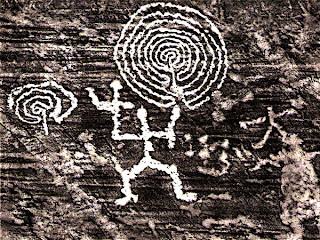 Another interesting bit of research, it turns out the cup and ring style of rock art has also been found in America: Alabama, California, Georgia, Hawaii, Texas." 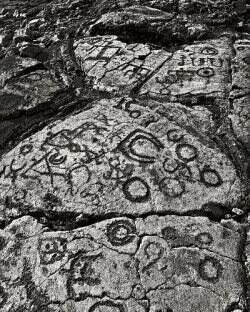 Amazingly these petroglyphs below show up in Pre-Columbian Hawaii. "They were used as the first means of written communication. These carvings can be found on all of the Hawaiian Islands, in more than 100 different locations". 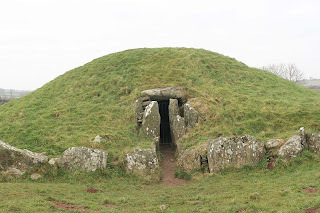 Scattered across the landscape is an exceptional archaeological record of successive cultures including the remains of Palaeolithic tools, Neolithic villages around 4,000 years old and Iron Age metal-working sites from 2,500 years ago. 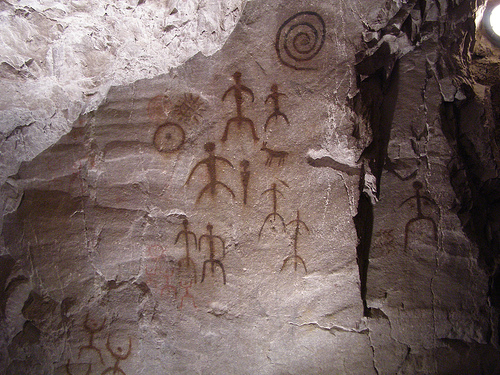 These figures in Val Comonica, Italy, show a transitional phase from literal to symbolic representations. 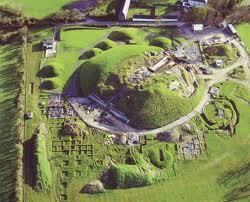 There is also a rather simple reason these megalithic sites are so often circular in formation. A circle provides for the most interior area versus exterior surface area. This conservation is seen throughout the natural and physical world, it is the same reason bubbles are round. Furthermore, impact crater sites which were and still are, mined for resource are circular scars left on Earth's surface. The idea of tranquility is beautifully conveyed on the curves and swirls of the front entry stone at New Grange. The entire surface is covered as if to say, 'Here is a safe haven'. Incognito places like New Grange may have been used as trade centers or by upper ranking leaders to discuss and coordinate defense strategies in order that they remain safe. The sketch above is based on an image found carved in Knowth in Ireland. This might be a safe passageway connecting two safe zones. 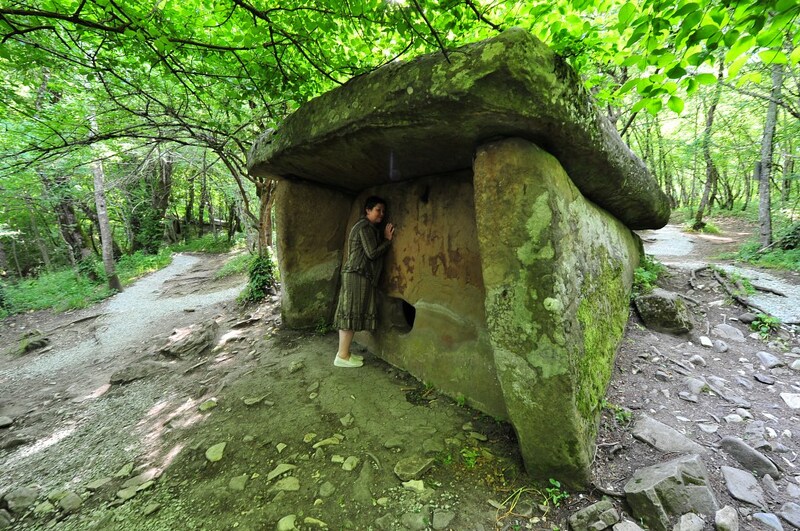 This intriguing piece below found in The Anta Grande do Zambujeiro, one of the largest megalithic monuments on the Iberian Peninsula, shows a possible way this information was transported. There are several physical features so many of these sites share around the globe engulfing an enormously wide range of space and time. It's almost unimaginable to us. I believe so much effort was put into them because the effort had become necessary. Their form was more to do with function and this is why their popularity spread. Like agriculture and pottery, the arts of commerce and war were becoming more sophisticated.